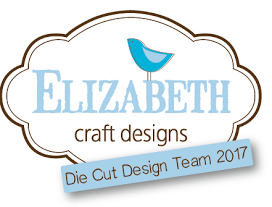 We're kicking off a new Designer Challenge on the Elizabeth Craft Designs Blog today. For January it's all about Valentine's Day. 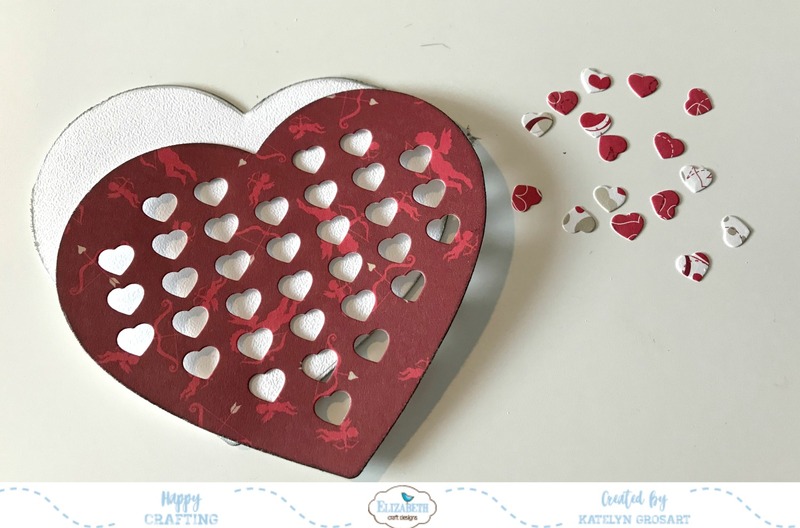 With this month's challenge in mind, I set out to create a cute Valentine's Day Card that you could give to that special someone in your life. 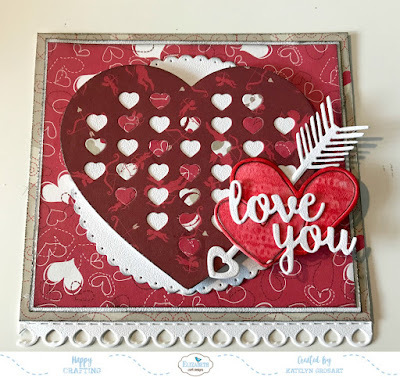 You'll want to make sure to read below as I have a tutorial for you so that you can re-create my Love You Card at home. 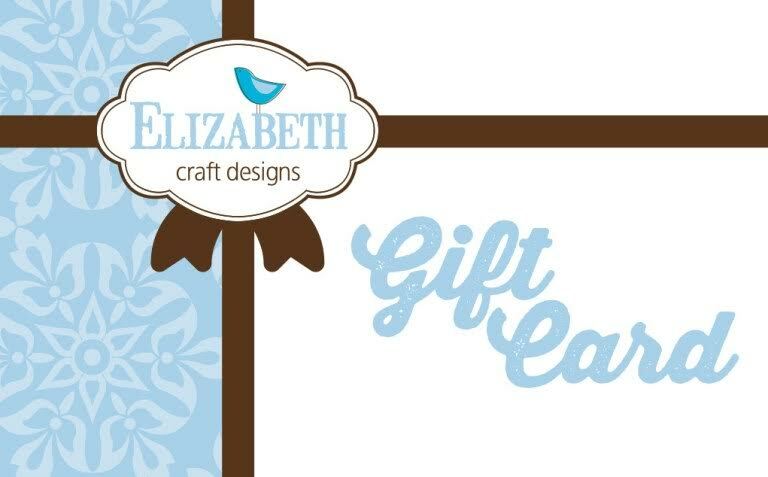 Read all the way down to the bottom of the post as I have some information on how to get in on a fabulous giveaway from Elizabeth Craft Designs. 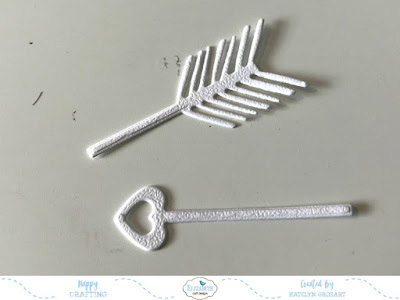 To start, die cut two of the hearts from the True Love Die out of White Soft Finish Cardstock. 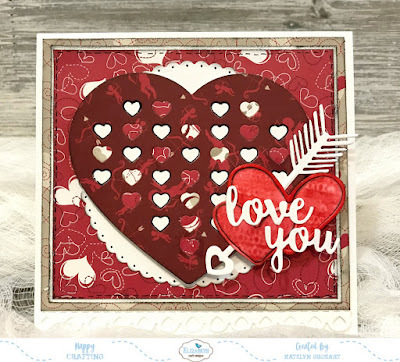 Blend Candied Apple Distress Ink using a blending tool with foam over the entire surface of each heart. 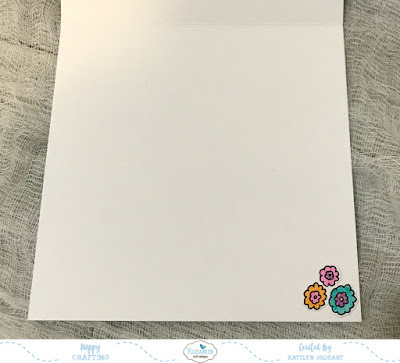 Apply VersaMark Ink to the xoxoxo stamp and stamp onto the hearts, making sure the hearts are covered with xoxoxo's. 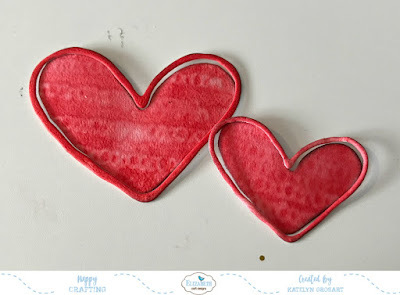 Ink the edges of the hearts using Black Soot Distress Ink and a blending tool with foam. From the Words 2 - Thinking of You die set, die cut the Love You out of White Soft Finish Cardstock. 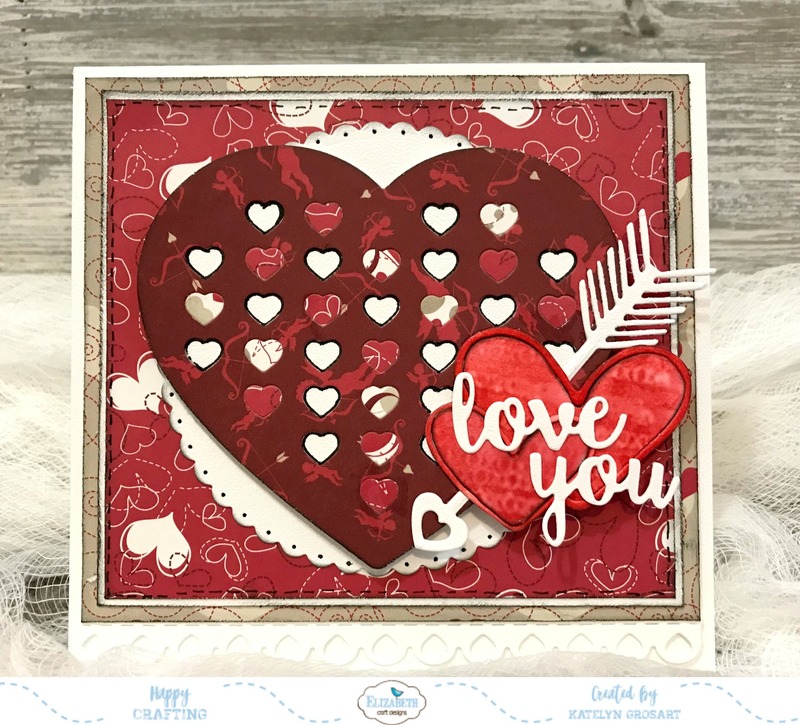 Die cut the Arrow from the Love Struck Die out of White Soft Finish Cardstock. 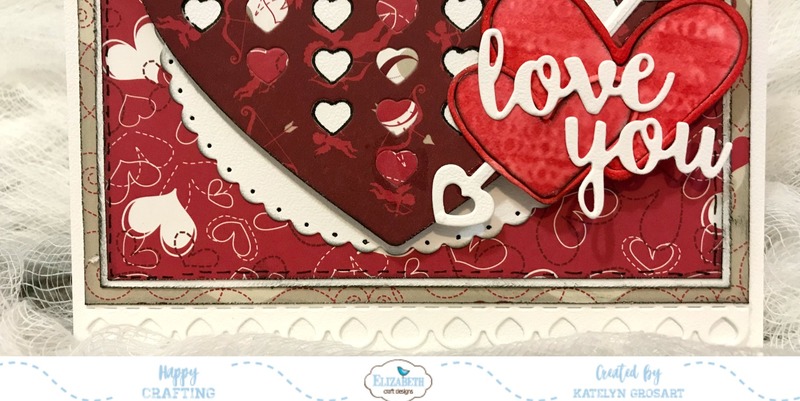 From the Valentine's Edges, die cut the scalloped heart border out of White Soft Finish Cardstock. Cut the border down to 4 3/4". 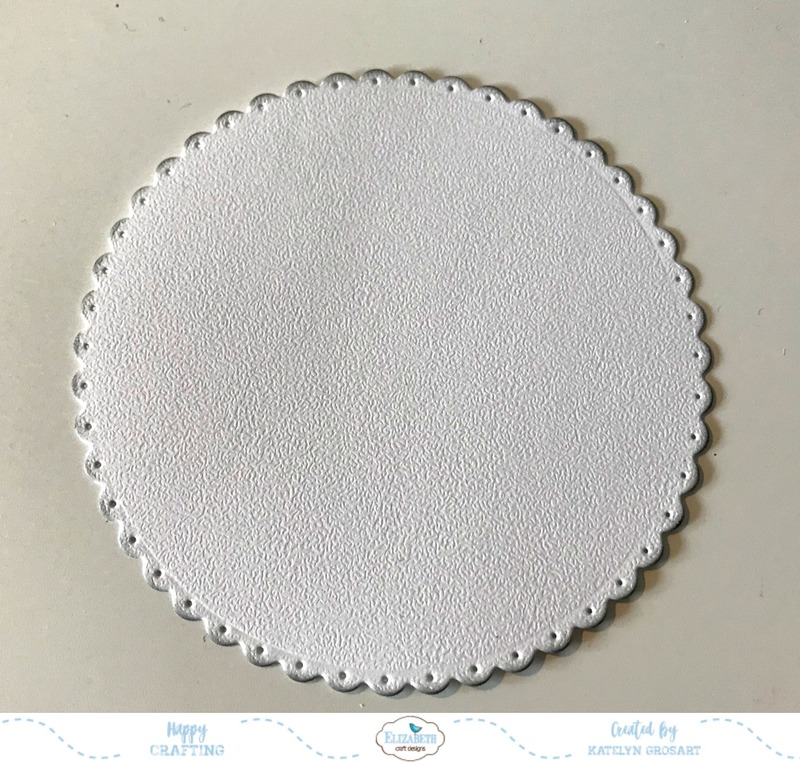 Die cut the 3 1/4" Dotted Scallop Circle out of White Soft Finish Cardstock. 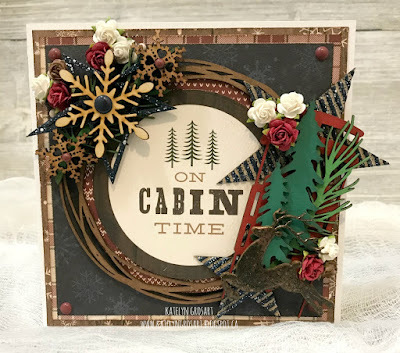 Ink the edges of the scalloped circle using Black Soot Distress Ink and a blending tool with foam. 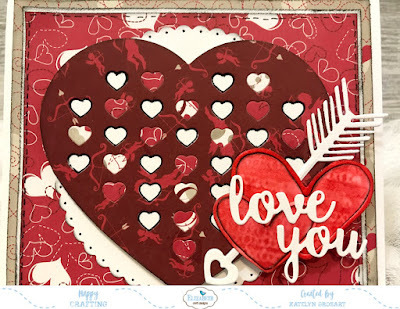 Die cut the Heart Cutouts three times on three different patterned paper pieces from ModaScrap's Simply Love Patterned Paper Pack. Die cut the outline of the heart out of White Soft Finish Cardstock. 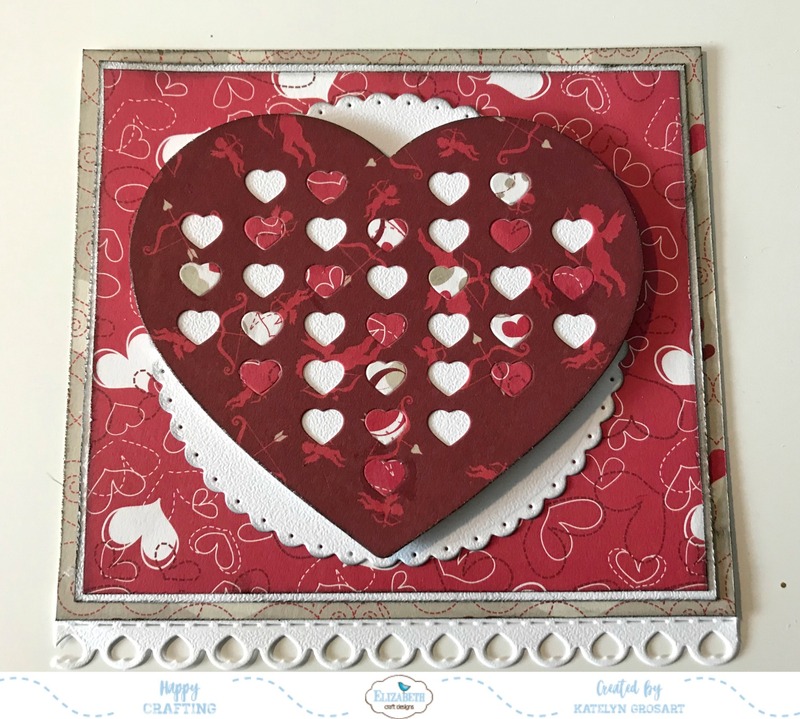 Choose which patterned paper you want to use as your heart that you've die cut the small hearts from. 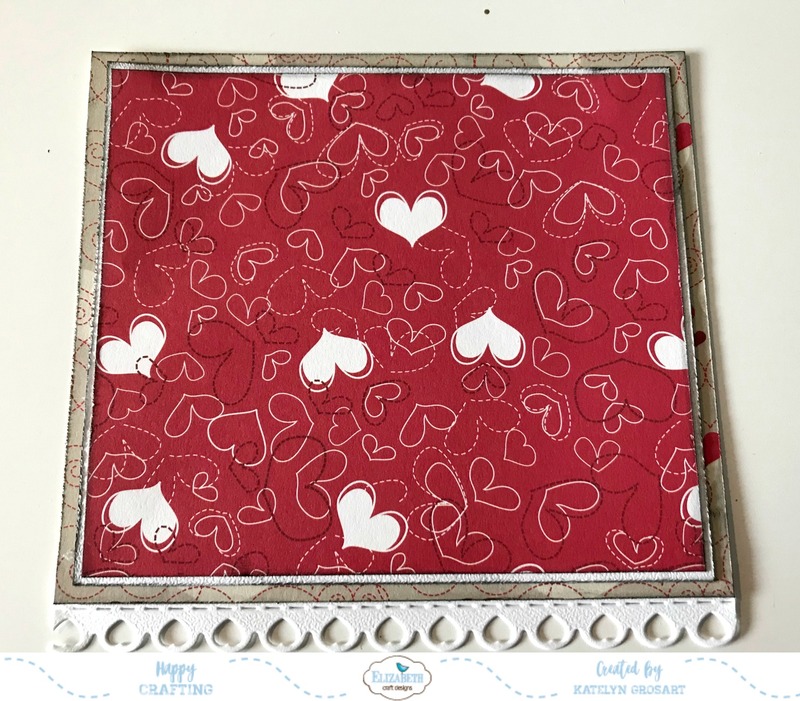 Place the heart outline around the heart cutouts to create your patterned paper heart. Ink the edges of the two hearts using Black Soot Distress Ink and a blending tool with foam. 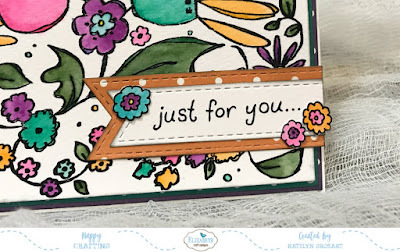 From ModaScrap's Simply Love Patterned Paper Pack, choose two patterned papers. Cut one of the papers down to 4 3/4" x 4 1/4". Cut the other patterned paper to 4 3/8" x 3 7/8". 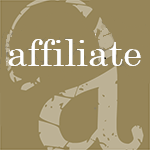 Cut a piece of White Soft Finish Cardstock that measures 4 1/2" x 4". Distress the edges of each paper and ink the edges using Black Soot Distress Ink and a blending tool with foam. Adhere the White Soft Finish Cardstock to the 4 3/4" patterned paper piece. 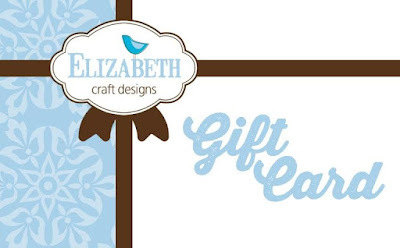 Adhere the 4 3/8" piece of patterned paper to the White Soft Finish Cardstock. Adhere the scalloped heart border to the bottom of the 4 3/4" patterned paper piece. Adhere the heart cut out to the white soft finish cardstock heart. From the hearts that you die cut out of the patterned paper, adhere them randomly to the hearts on the heart cut out. 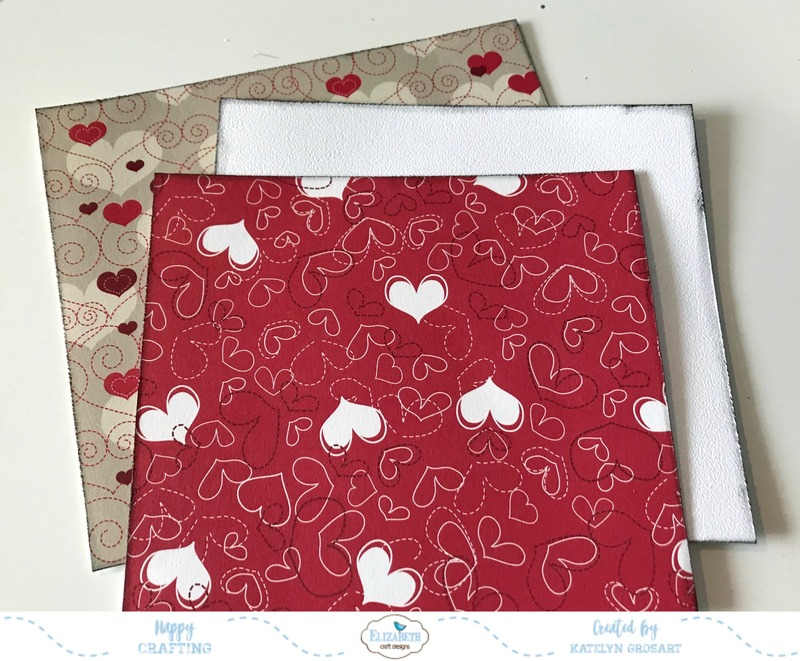 You'll want to leave some of the hearts just showing the white soft finish cardstock. 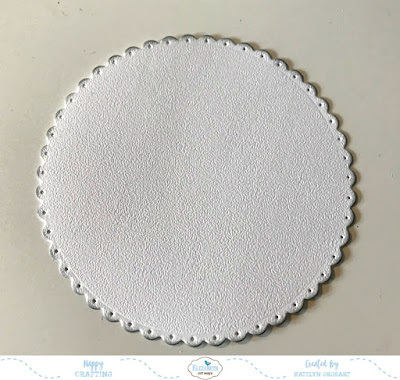 Adhere the dotted scallop circle to the middle of the patterned paper. Foam square the heart to the middle of the dotted scallop circle. 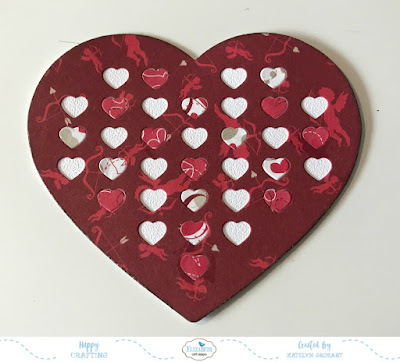 Adhere the arrow, two hearts and the Love You sentiment on the bottom right hand side of the large heart. Take a Zig Marker and create stitch marks around the 4 3/8" piece of patterned paper. 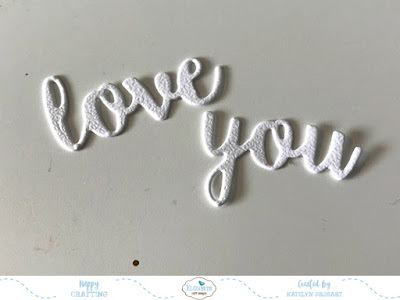 To finish off your card, adhere the card front to a piece of White Soft Finish Cardstock that measures 5" x 9 1/2", score at 4 3/4"
Here are a few close up photos of the Love You Card. 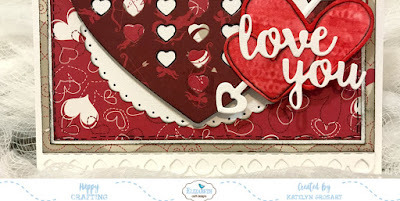 Here's the finished Love You Card. I have one more project to share with you today. 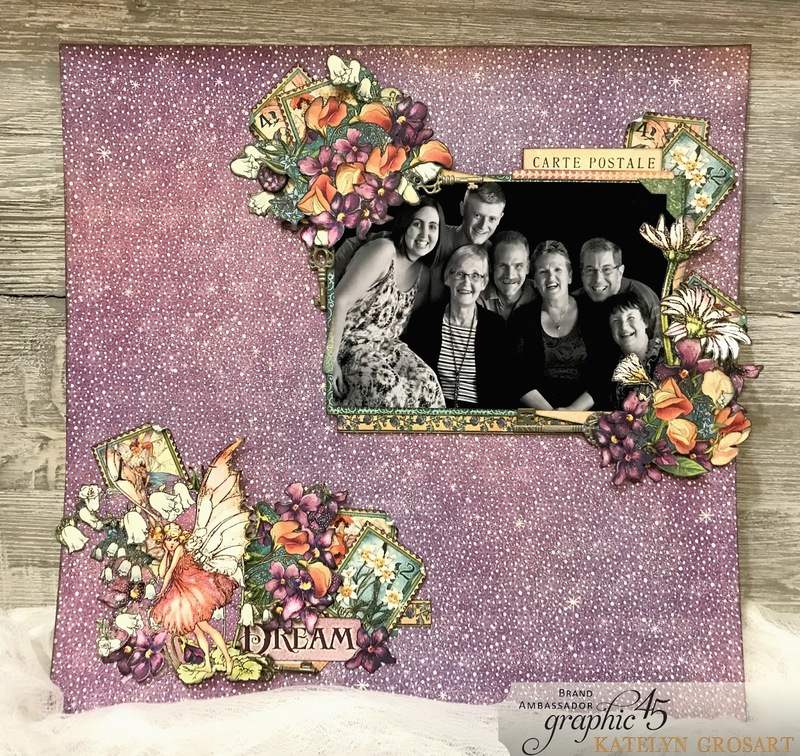 I'm up on Graphic 45's blog sharing with you my Dream Scrapbook Layout which features the Fairie Dust Collection as well as a few of their Staples from the Staples Collection. 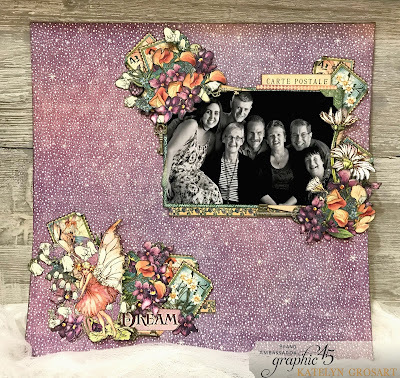 I have a few photos to share with you on my blog, but if you haven't stopped by Graphic 45's blog yet, make sure you do so that you can check out the rest of the photos of my Dream Scrapbook Layout as well as a tutorial so that you can recreate it at home. 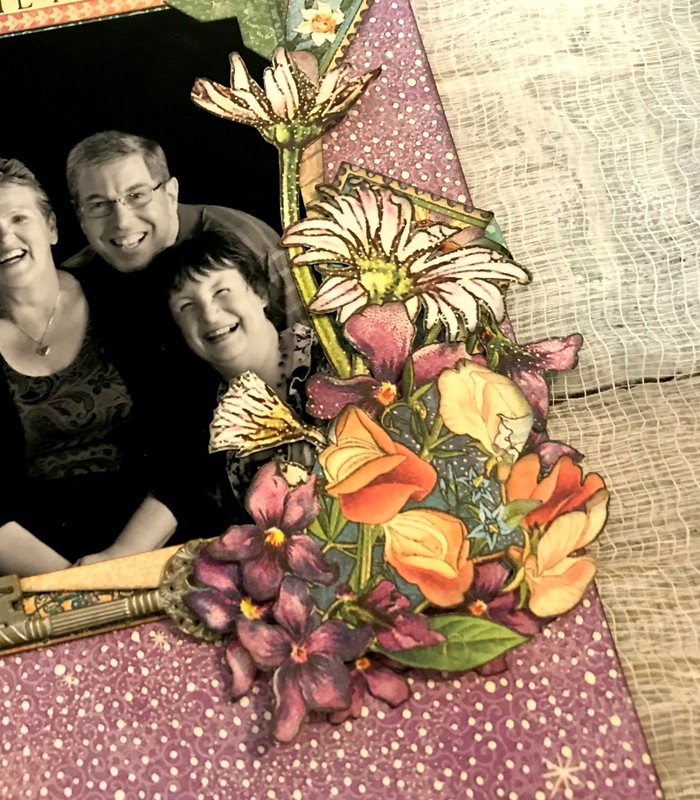 With our winter being very wet and grey, I was ready to play with brighter spring like colours and I ended up creating this pretty Dream Scrapbook Layout which features a family photo taken on our Alaskan Cruise. This layout can be used for a variety of different themes, not just family photos. Tip: From the Decorative Stickers, adhere a photo corner into the lighter embellished corner. 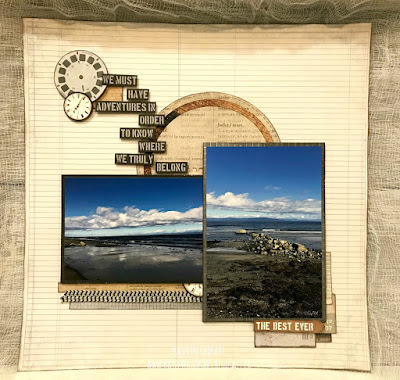 For a full tutorial on how I created my Dream Scrapbook Layout as well as some more photos of my project, you'll want to stop by Graphic 45's blog. Happy Monday! 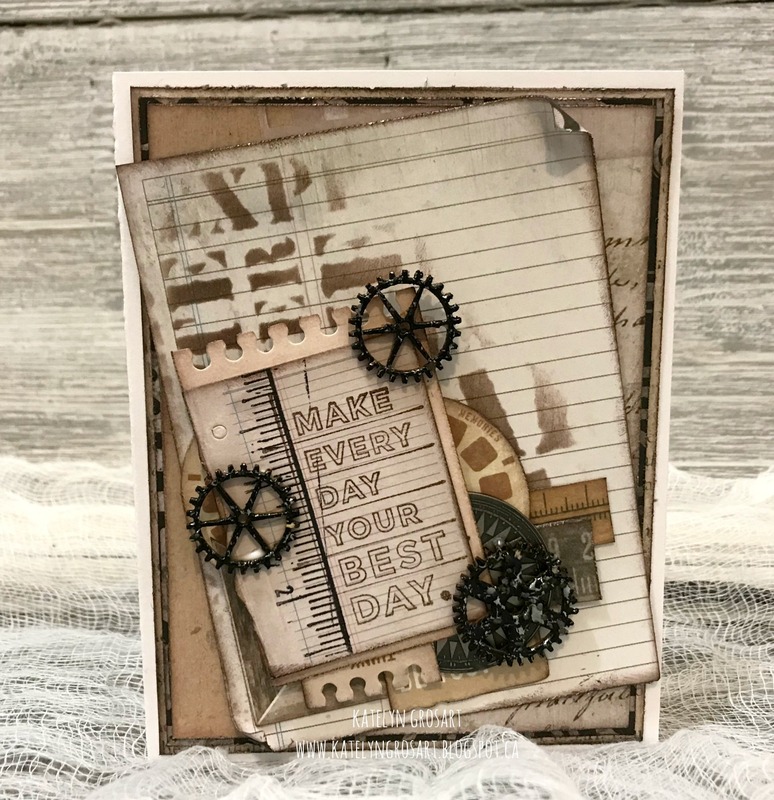 I'm back on Scrap Shotz's blog today sharing a few more projects using the January Kit which features Kaisercraft's "Documented" collection. I hope that my projects will inspire you to recreate them at home. You'll want to make sure to stop by Scrap Shotz's Blog so that you can see and read all the details about the three projects using the January Kit. 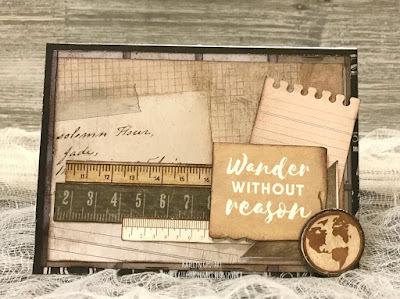 You also won't want to miss the tutorial for my altered clipboard. I'm back with one more post for you today. 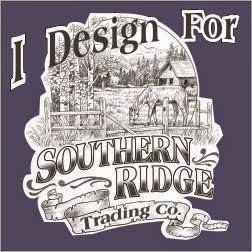 It's a sneak peek of a new project that will be on Graphic 45's blog. Make sure to mark your calendars for Monday, January. 29th. 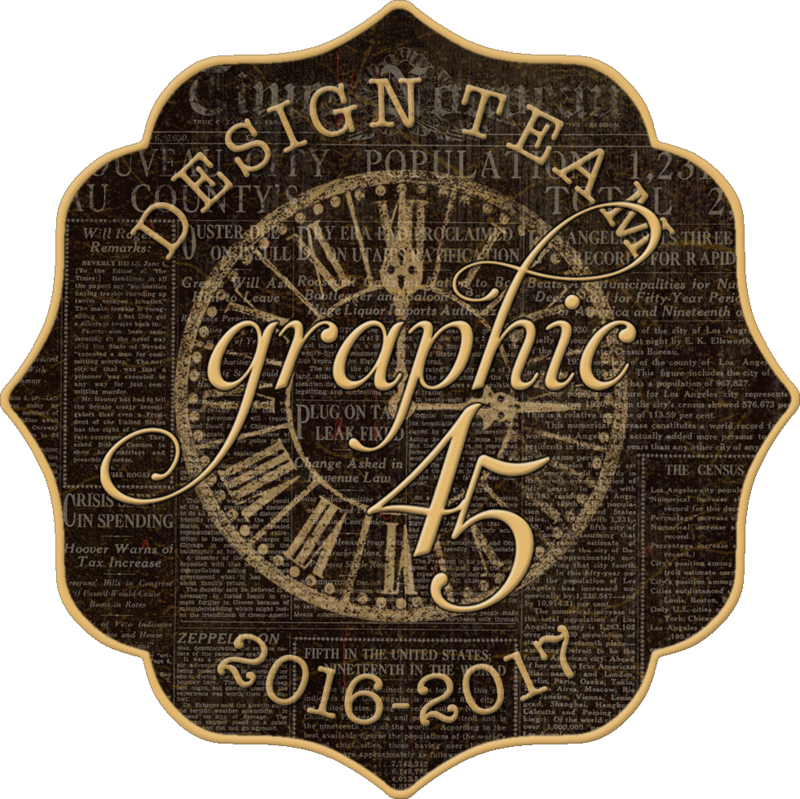 I hope that you'll take the time to stop by the Graphic 45 blog and check out all the photos of my project. I will be sharing some photos and other details about this project on my blog on Monday. I'm back on Southern Ridge Trading Company's blog today to share with you my shabby chic Love Tag which is perfect for that special someone on Valentine's Day. 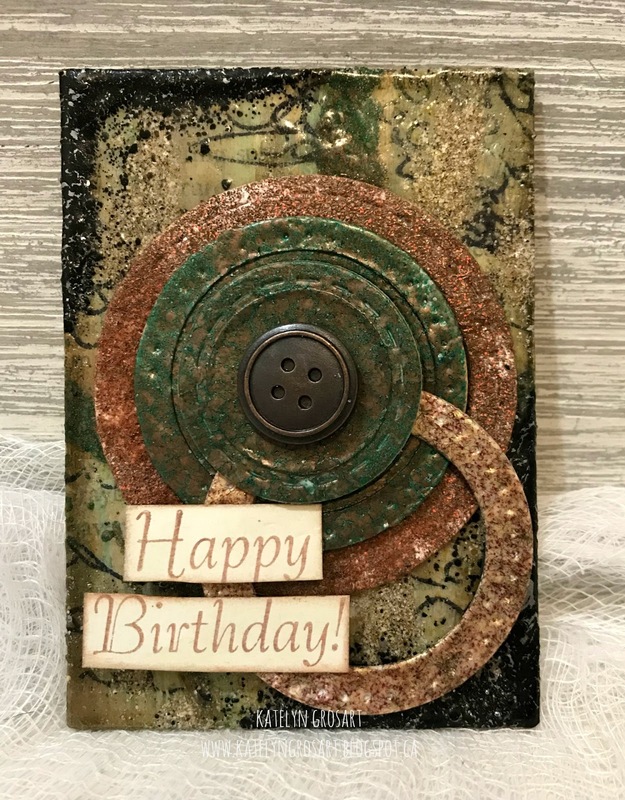 This tag features a variety of chipboard frames, embellished with different techniques. 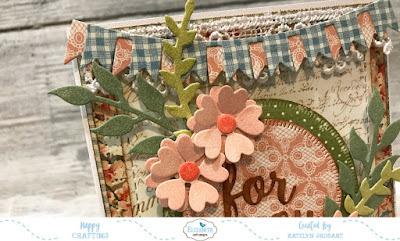 I hope that my shabby chic Love Tag will inspire you to want to recreate it at home. 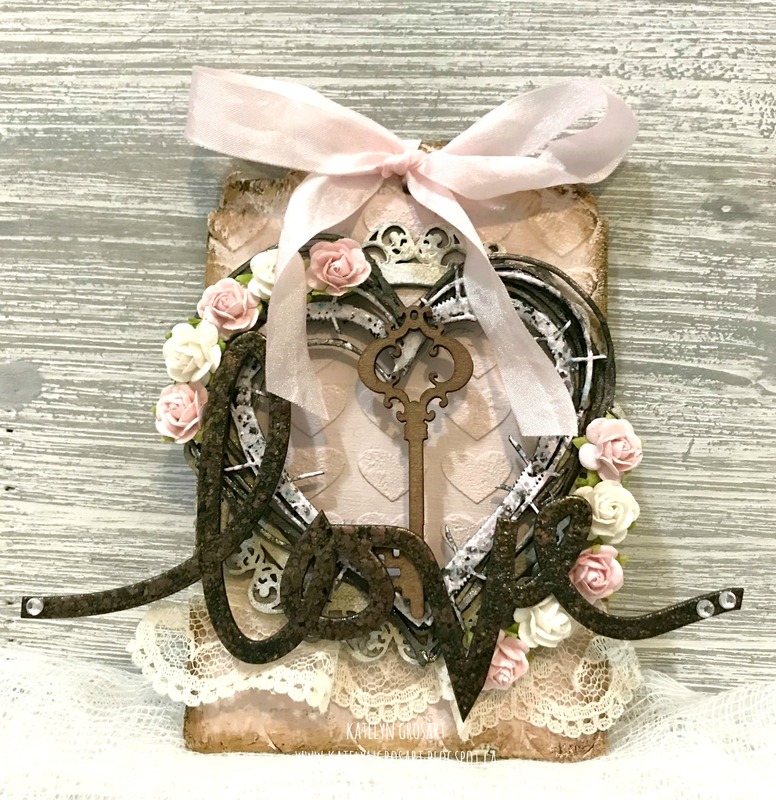 You'll want to make sure to stop by Southern Ridge Trading Company's Blog so that you can learn how to recreate my shabby chic Love Tag at home. Happy Friday! 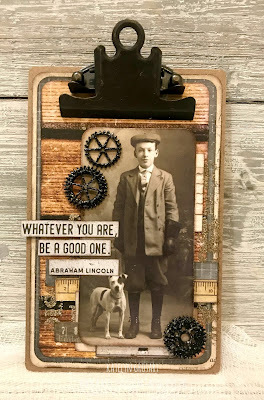 I'm up on Scrap Shotz's blog today sharing a scrapbook layout featuring the January Kit. I hope that my layout will inspire you to recreate it at home. 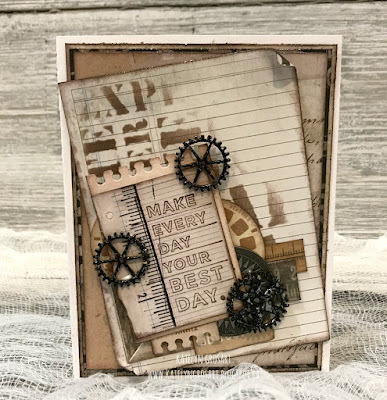 You'll want to make sure to stop by Scrap Shotz's Blog so that you can see the rest of the details on my scrapbook layout. You'll also want to stop by next week as I will be sharing a few more projects the feature the January Kit. Happy Monday! 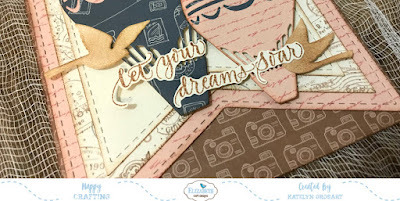 It's a new release day over on the Elizabeth Craft Designs blog, featuring Joset Designs new die and stamp release. You'll want to stop by my blog tomorrow as we have one more release post featuring inspiration on the Elizabeth Craft Designs blog. For my project featuring some of the new Joset Designs dies, I created this pretty For You card. The leaves are from the Trio of Leaves die and coloured using Bundled Sage and Shabby Shutters Distress Ink. 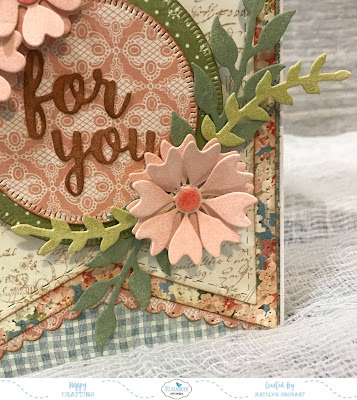 The flowers are from the Small and Large Flower Set and coloured using Abandoned Coral and Tattered Rose Distress Ink. 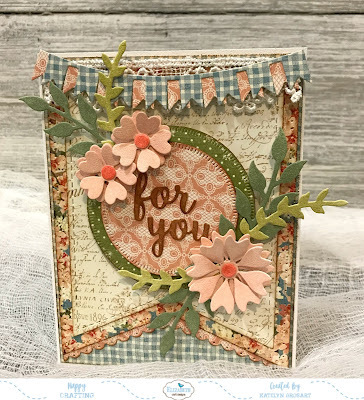 For the "For You" sentiment, I die cut it out of the Words 2 - Thinking of You set and coloured it using Vintage Photo Distress Ink. For the banner, I cut two banners from the Celebration Flags die using patterned paper from the Secret Garden collection. To finish off the edges of all the patterned paper pieces, I used Vintage Photo Distress Ink. Today, I'm excited to get to share with you my Follow Your Dreams Card that's on Graphic 45's blog. Although this card looks simple, there's a reason for that, I was challenged to create a project within 60 seconds. With only having 60 seconds to create a project, it makes you look at things a little differently. 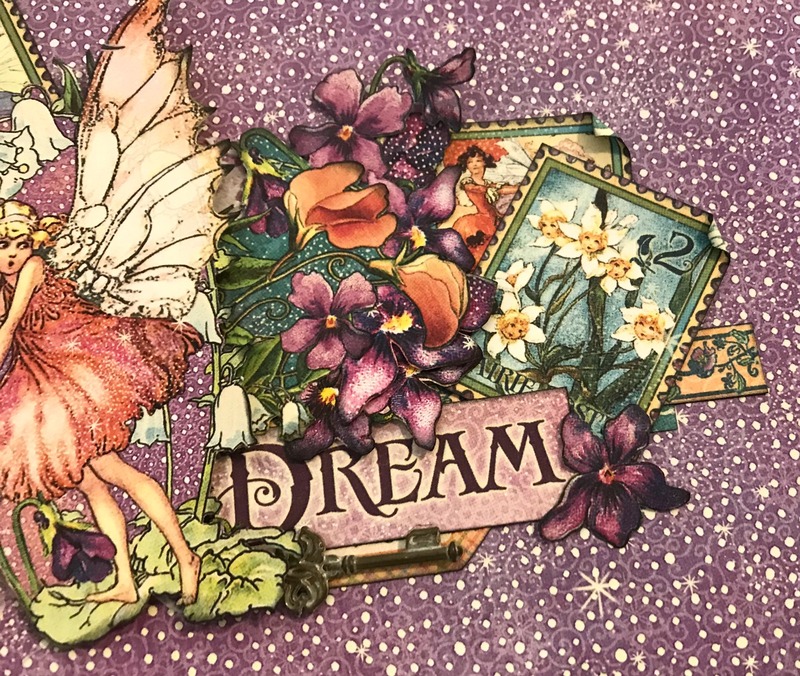 So, by using the Ephemera Cards from Fairie Dust, along with some patterned paper and decorative stickers, I was able to create this simple but quick card easy for anyone to recreate at home. 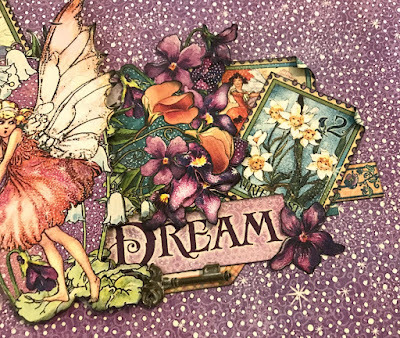 I hope that you'll enjoy the video tutorial of my Follow Your Dreams Card. 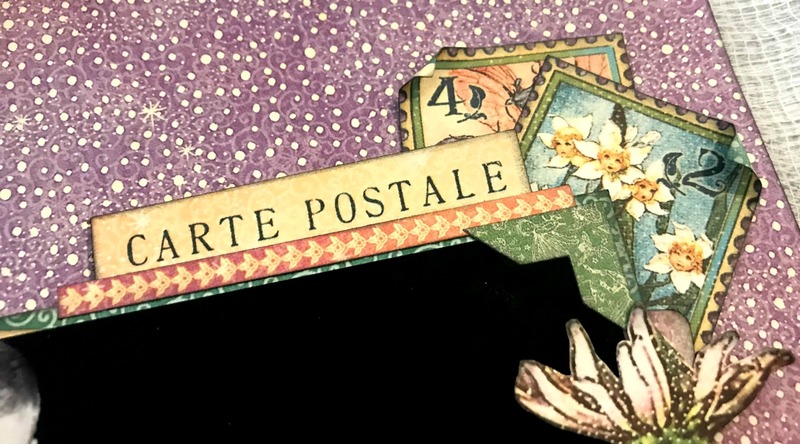 Tip: Use the photo corners from the Decorative stickers to add some interest in the corners of the Ephemera card. It's time for another new release day over on the Elizabeth Craft Designs blog, featuring Becky Seddon's new die releases. There will be one more of these release posts featuring inspiration using the new products throughout this month on the Elizabeth Craft Designs blog. 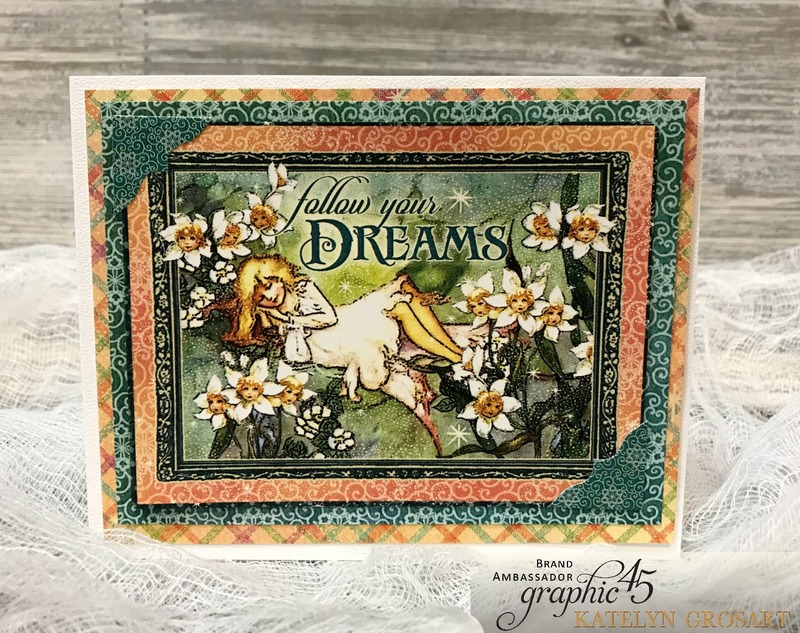 For my project, I featured some of the new Becky Seddon dies and I created this Let Your Dreams Soar Card. 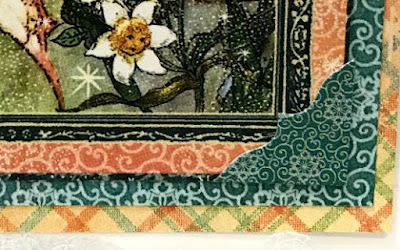 For the base of the cardfront, I layered three of the Stitched Fishtails together using patterned paper from ModaScrap's Viaggi Vintage Paper Pack. All three Hot Air Balloons can be found in the Vintage Balloon Race die. 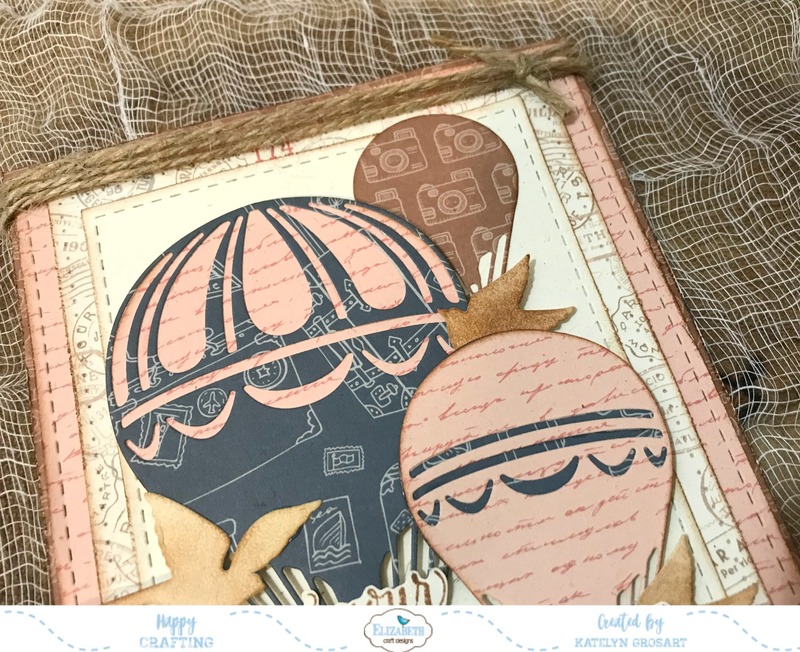 I layered patterned paper in behind the balloons that had some cut out pieces. 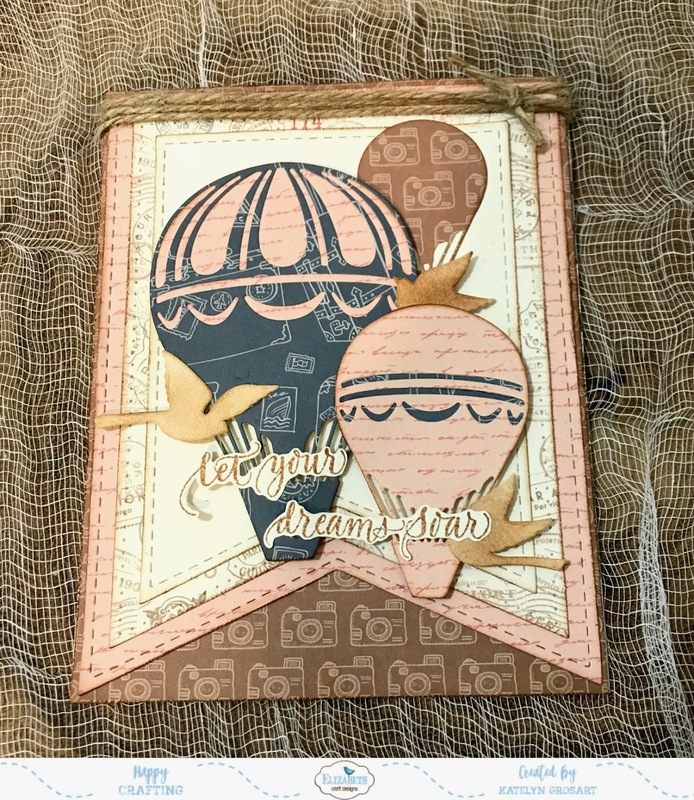 To layer in amongst the hot air balloons, I cut out three birds from the Free as a Bird die and blended Vintage Photo Distress Ink over each bird. 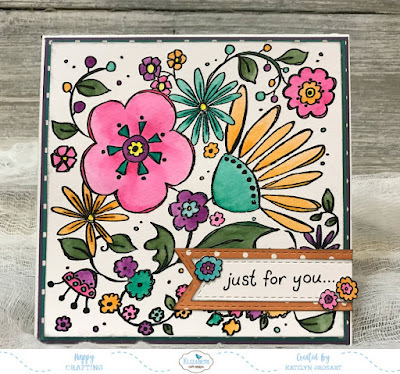 The sentiment came from the Soar Collection Clear Stamp set. I stamped the sentiment in Vintage Photo Distress Ink on the backside of one of the scrap patterned paper pieces. You'll need to fussy cut the sentiment out. I placed the last bird in amongst the three hot air balloons. In the top portion of the card, I wrapped some twine three times around the top of the card and tied a knot at the top right hand corner. To finish off the edges of all the pieces, I used Vintage Photo Distress Ink. You'll want to make sure to check out the rest of the projects the design team has created using Becky Seddon's dies on the Elizabeth Craft Designs blog.